Our product range includes a wide range of steel coil handling mobile gantry crane equipment and wind mill blade handling gantry crane. Steel Coil Handling Mobile Gantry Crane Equipment is efficient Solution for Over Sized Out of Gauge Loads. Overall dimensions can be customized to suit the customer's application. Independent telescopic for maximum lift whilst also capable of passing under low heights. Independent lift allows lifting and lowering of coil/load. Rotating C-Hook for handling coils in both directions and rotating, manual or automatic option. 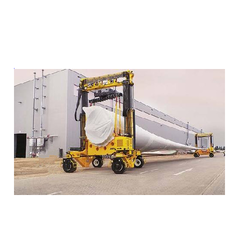 We offer Wind Mill Blade Handling Gantry Crane to our valuable clients. Full side shift from left to right increases storage and flexibility.